The American Dietetic Association has acknowledged just how healthful a vegan diet is. So do we even need to consider supplementation? While a well-planned vegan diet with a variety of whole, plant-based foods is arguably the healthiest on the planet. Supplementation may still be a wise choice to consider. Anyone who has been vegan has been asked about various nutrients and how they obtain them (protein deficiency anyone?). The truth is that all modern day diets may require supplementation due the degradation of our soil. And that veganism is not alone in this. 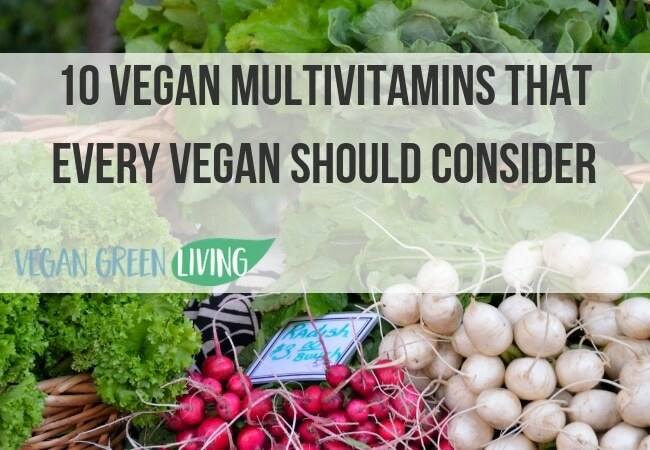 A multivitamin is an easy way to cover one’s bases and ensure they’re getting all the nutrients they need to thrive while living a vegan lifestyle. What nutrients are best to look for when seeking out a multivitamin? 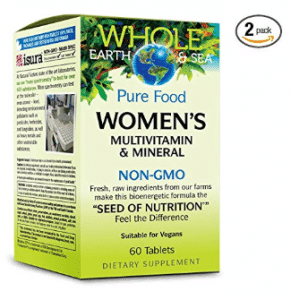 This whole food-based multivitamin is available for men, men 50+, women, women 50+ and pregnant one. This multivitamin is one of the highest quality ones available. They use organic, non-GMO produce to create a whole food’s supplement with noteworthy ingredients. They include kale, acai, spirulina, milk thistle and echinacea. This multivitamin meets or exceeds the daily needs of most vitamins and minerals. It also contains adequate amounts of D3, B12, Zinc, and Iron. This product is unique in that it contains 100 percent of the daily value of both vitamins K2 and Iodine. This vitamin is great for those with food allergies as it is free of both gluten and corn. 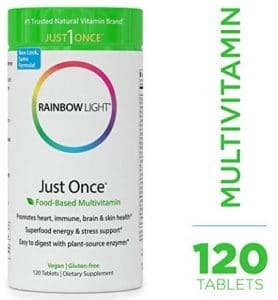 Vegan actress Alicia Silverstone’s collaboration with supplement maker Garden of Life resulted in this whole foods based, organic, non-GMO multivitamin. This company caters to varying age groups with both woman and men as well as including several prenatal options. This whole foods based multivitamin contains star ingredients. Which include holy basil, moringa, raspberry and asparagus. This supplement meets or exceeds the RDA for both vitamin D and vitamin B12. This multivitamin is certified gluten-free. 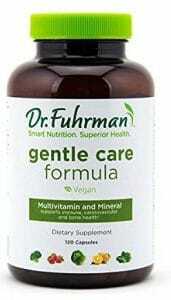 Nutritarian Vegan Doctor Joel Fuhrman has formulated a line of vegan multivitamins in a variety of forms. And are available for men, women, children and pregnant women. The Gentle Care Multivitamin is specifically created to be gentle on digestive tracts and was created without vitamin A or folic acid. According to its description, “which may increase the rate of certain cancers." 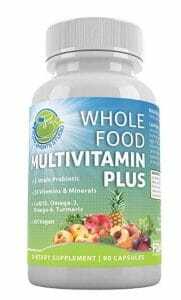 This multivitamin has a whole foods blend including watercress, goji berries, broccoli sprout extract and wild bilberry extract. Moreover, this multivitamin meets or exceeds the RDA for both vitamin D and vitamin B12. It is worth noting this vitamin contains iodine, vitamin K2 and sunflower lecithin. Furthermore, it is non-GMO and does not have any gluten-containing ingredients. 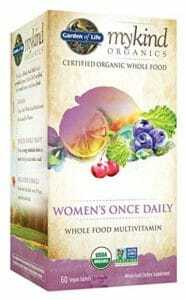 Naturelo makes a variety of whole foods based multivitamins for men, women and pregnant women. This well-rounded multivitamin has a variety of organic foods such as broccoli, gingko biloba, and turmeric. Additionally, it meets or exceeds the RDA for both vitamin D and vitamin B12. It contains high amounts of vitamin K2, Iodine and Iron. Furthermore, it has a variety of additional extracts and nutrients. Such as astaxanthin, resveratrol and enzymes. They help support eye, heart and digestive health. This supplement is GMO, yeast, soy, gluten and corn free. Supplement Studio has created a whole food multivitamin that has a variety of added extracts and nutrients. This multivitamin contains organic fruits, vegetables and mushrooms. Some are Brussel sprouts, noni, shitake mushroom and reishi mushroom. Also, this vitamin meets or exceeds the RDA for both vitamin D and vitamin B12. Furthermore, it also contains iron, iodine and vitamin K. And also has the added benefit of probiotics. Making it a stand out multivitamin. This multivitamin is free from GMO’s and gluten. This supplement company has been in health food stores for what seems like forever and is easily found. This affordable one tablet a day multivitamin meets or exceeds the RDA for both vitamin D and B12 however they are both the less absorbable forms. This multivitamin does contain a wide range of minerals as well as Iodine. 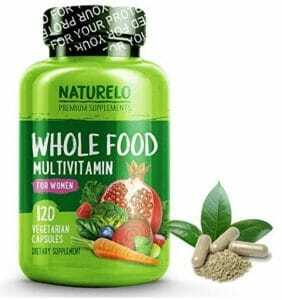 Additionally, this multivitamin stands apart from others as it contains an herbal superfood energy mix of spirulina, gingko and stinging nettles. As well as a digestive enzyme blend. For those with allergies, this product is both gluten and tree nut free. 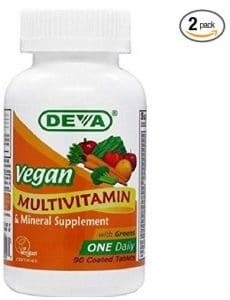 Vegan supplement company Deva has a line of vegan multivitamins all certified vegan by The Vegan Society. This multivitamin has a greens and herbs blend. It includes spirulina, chlorella, parsley and Aashaadha. This affordable multivitamin meets or exceeds the RDA of vitamin D and B12. However, they are both the less absorbable forms. It’s worth noting this multivitamin meets the RDA for iron as well as iodine. From Vegan Supplement company VegLife. This multivitamin is very basic but contains a wide array of vitamins and minerals. This multiple meets or exceeds the RDA for both vitamin D and B12. This multivitamin is formulated to be iron free. It is perfect for those whose digestion does not appreciate the extra iron. This certified organic multivitamin uses pectin rather than gelatin to create a gummy alternative to traditional capsules or tablets. This multivitamin contains fruits and herbs such as guava, amla and holy basil. This product has contains high amounts of B vitamins making it great for energy as well as a range of minerals. This multivitamin does not contain vitamin D or vitamin B12. Which mextraional supplementation necessary. From the vegan and organic company Healthforce Nutritionals comes this high-quality organic superfood powder. 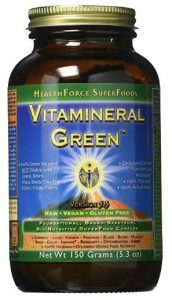 Vitamineral Green is not quite a multivitamin. However, it contains a variety of nutrient-dense superfoods that can help to round out or give an extra boost to a well-planned vegan diet. They include shilajit, barley grass, kelp and dulse. This alkalizing whole food supplement contains both iron and calcium, as well enzymes. Since this supplement is not quite a multivitamin, it does not contain vitamin D or vitamin B12. Which makes additional supplementation necessary. A variety of five different sea veggies provide thyroid support, while carob, ginger root, chlorella, and enzymes help digestive support. While everyone’s needs may vary based on diet, lifestyle, activity levels and health challenges. Generally, it is wise to seek out a multivitamin containing vitamin D and B12. Iron and calcium can be areas of potential deficiency. However, not all multivitamins contain these. So if you want to supplement with them, most of the time an additional supplement outside of a multivitamin should be sought out. A few more natural alternatives to supplemental vitamins are available in food form or from the sun! A natural alternative to supplemental vitamin D is soaking up the sun. Studies have shown exposing as much bare skin (no sunscreen) as possible midday for at least thirty minutes a few times a week. Is the most effective way for our bodies to obtain the vitamin D we need. A natural alternative to supplemental B12 is using nutritional yeast. It is a delicious form of inactive yeast that is filled with B vitamins, including B12. One additional supplement for thought, is DHA. It is an omega 3 fatty acid that we need for brain health and is not often found in multivitamins. It is also important to acknowledge that not all healthcare professionals believe multivitamins are effective or useful. Processing and removing nutrients from their whole foods form can render them ineffective. Also, utilizing a well-balanced, whole foods diet is the best protection against deficiency and disease. It is best to do your research and follow your gut. Talk to your healthcare practitioner when deciding whether supplementation is necessary or not for you. Now that we know what basic items to look for in vegan multivitamins, the question turns to what is in a multivitamin that makes it not vegan-friendly? To determine whether a multivitamin is vegan, an easy place to start is checking the source of the capsule or tablet. If a capsule is made of gelatin, it is automatically not vegan. Because it is made from the skin, cartilage and bones of animals. So stick to vegetable cellulose capsules. 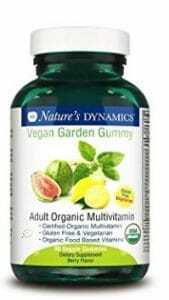 ​If your multivitamin is a tablet it can be a bit trickier to tell if it is vegan. Both magnesium stearate and stearic acid are used in tablets and can be from an animal or plant source. And so, it is best to see if the product has a vegan seal and if not, it is wise to call the company to check on the source. ​Another important place to check is the vitamin D source that a multivitamin uses. Also, most multivitamins now use D3. As it is a more effective form of vitamin D, and this can be from either plant or animal sources. ​Some products will list next to the D3 that it is from fish or lanolin, both of which aren’t vegan. If the D3 is vegan, it can be from a variety of sources such as algae or lichen. If your product doesn’t list the source of D3 it is again wise to check for a vegan seal on the container. Or call the company to find out the source. Other items that are worth investigating as they can be animal based include lactic acid, lipase and carotene. ​One easy way to be sure your supplement is vegan is to look for a vegan label or seal. Additionally, if you don’t recognize it then be sure to research it to ensure it truly is free of animal products. ​We’ve done some research for you. 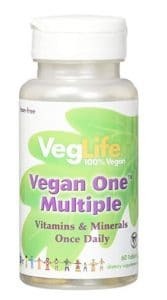 And have found a variety of vegan multivitamins that range from basic, and super affordable. To more advanced and often more natural, which tend to be more expensive. Whatever your budget, consider the following our ultimate list to consider.